This weekend, our Brick Lane store played host to a very special event. 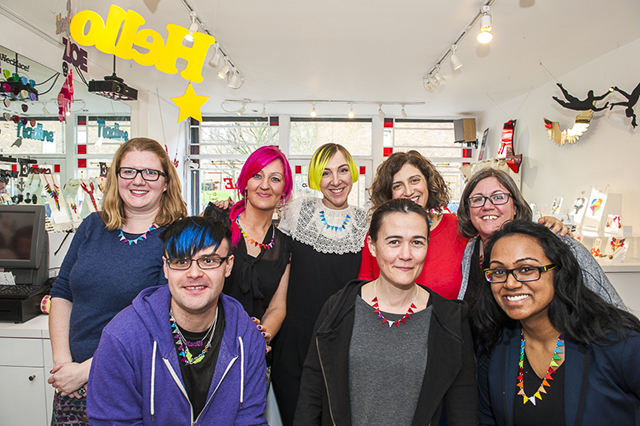 Tatty Devine co-founder Harriet Vine joined an eager group of Tatty Devine customers to lead them in their first Bunting Necklace Workshop. 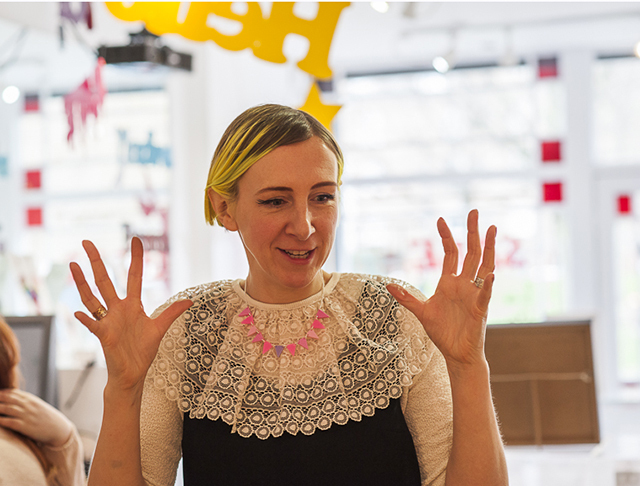 Well, who could be better to share our jewellery making secrets than our Creative Director? The morning got off to an excellent start, with each guest greeted with a glass of bubbly, fresh fruit and delicious pastries (we had to try one, purely for research purposes, you understand!) 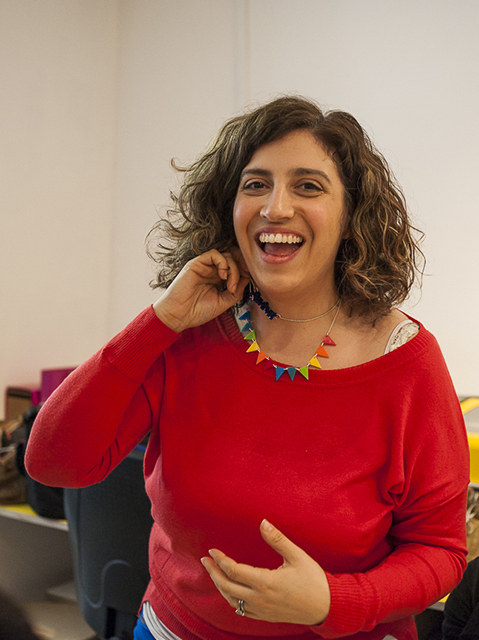 Just in case anyone needed a little design inspiration, there were plenty of Bunting Necklaces on hand: Before we began, Harriet shared the story behind the original Bunting Necklace that featured in our Spring Summer 2000 collection. Inspired by her desire to dress as a traditional village fete, the triangles were cut by hand from fabric and attached to twine to create a miniature version of a British classic. Excited by their creation, Rosie and Harriet headed to Southend and took photographs of themselves wearing the jewellery on the beach - it was Tatty Devine's first real photo shoot! 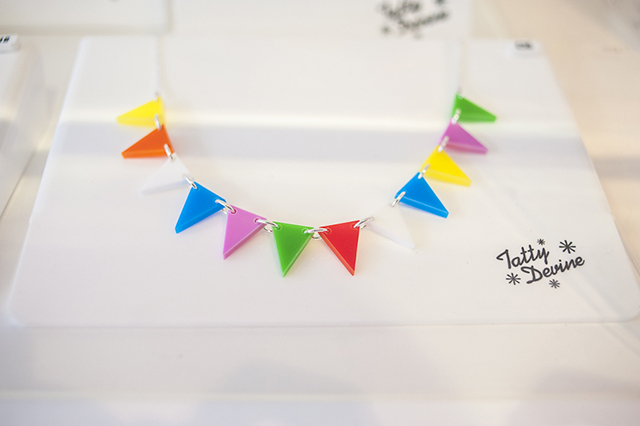 The first step was choosing a colour theme for the Bunting Necklace. 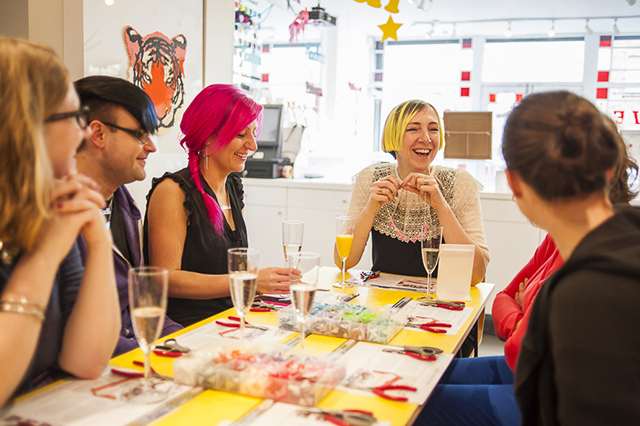 It was a little tricky, especially as we gave our guests a choice of glitter, pastel and bright Perspex pieces: Next, Harriet schooled our guests in getting to grips with their pliers and the art of opening and closing jump rings. 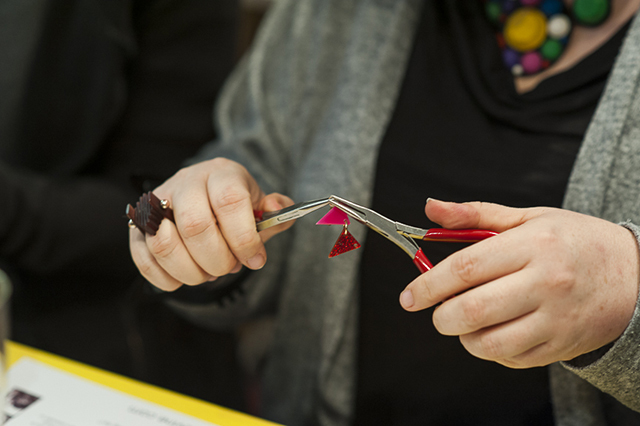 Our talented jewellery makers were on hand to make sure everyone picked up the technique (and they did! ): Full speed ahead! 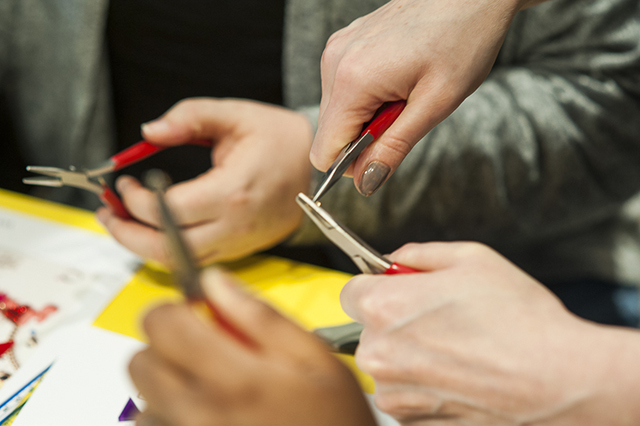 Armed with newfound plier skills, our workshoppers began piecing together their bunting: Ta-da! 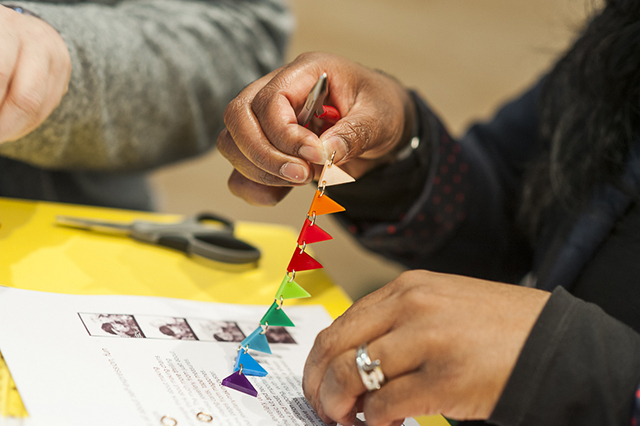 Just look at that bold and bright rainbow design: After the workshop, there was plenty of time for our workshoppers to use their 20% discount and chat dream designs and favourite archive pieces with Harriet. They quizzed her all about some very exciting new jewellery launching soon. Ooh, la la! Harriet might even have been some sneaky hints about our Autumn Winter 2014 collection. Our lips are sealed... Thank you all for joining us, everyone! Harriet had so much fun spending the morning with you all - and was totally blown away by each unique Bunting Necklace design. Thank you to our photographer Carys for capturing all the fun, too! 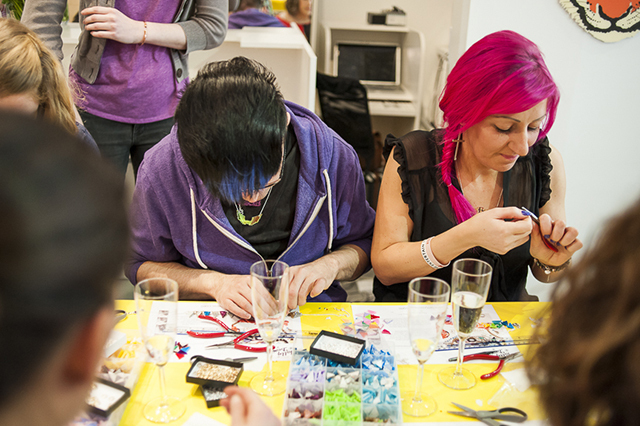 Fancy getting creative with Team Tatty? 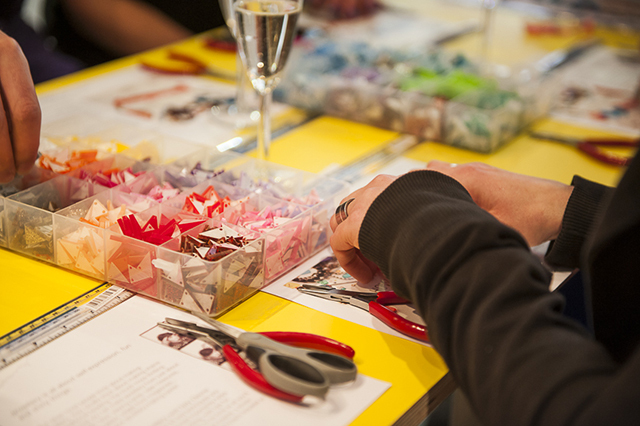 Don't miss out our upcoming jewellery making workshops this weekend. Places are limited - book now!